Today we would like to shine a light on this fantastic invention. The Coca-Cola Company, together with DEKA R&D, and other critical partners including development banks, NGOs and companies, launched EKOCENTER™. 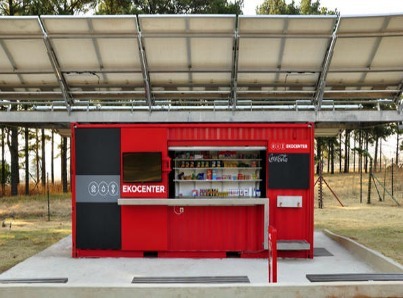 Made from a 20 foot container, this EKOCENTER is a modular designed kiosk housing a water purification system. This container is a hub of community activity, which offers clean, safe drinking water, along with other basic necessities. The project began in South Africa in August 2013 and by 2015, it is hoped that by 2015 there will be between 1500 and 2000 units placed in Africa, Asia, Latin America and North America. For more information on this clever use of a shipping container, head to this website.